In 2014 the Dutch cabinet agreed to stop the licensing process of some smaller offshore wind farms 60 km offshore, in favour of developing large-scale offshore wind farms close to the Dutch coast. The coastal zones close the new sites are known as major tourist areas. On 11 October 2012, the Government of Estonia initiated maritime spatial planning in the marine area around Hiiu island in Estonia. The draft plan included the development of areas for offshore wind farms, and the area north of Hiiuma was deemed most preferable. Several island residents were not satisfied with these designations. In 2014, the planning authority of Mecklenburg Vorpommern decided to use a step by step approach is designation areas for offshore wind. The idea was to identify taboo areas where offshore wind could definitely not be located, as well as areas that would have no restrictions and could be used. The problem was that no areas emerged that had no restrictions at all. Conflicts mostly arise over the attachment people have to a particular landscape (fears of the visual impacts of wind turbines) and access to sea areas. Stakeholders related to beach and coastal tourism are often concerned that the visibility of offshore wind farms from the coast reduces the attractiveness of the place. This could negatively influence the number of visitors and with this the local economy. Local property owners (residents and second home owners) can be concerned that offshore wind farms might decrease the value of their house, although there is no evidence for such a decrease. Offshore wind farms can block potential sailing routes, or restrict the available space for other recreational activities, such as windsurfing or diving. The visual impact of offshore wind farms – whether real or expected – can give rise to emotional discussions. People can be very attached to a particular place and may strongly resent the visual intrusion caused by an offshore wind farm. Although the conflict over a wind farm may appear small, it can quickly escalate if these concerns are not taken seriously. 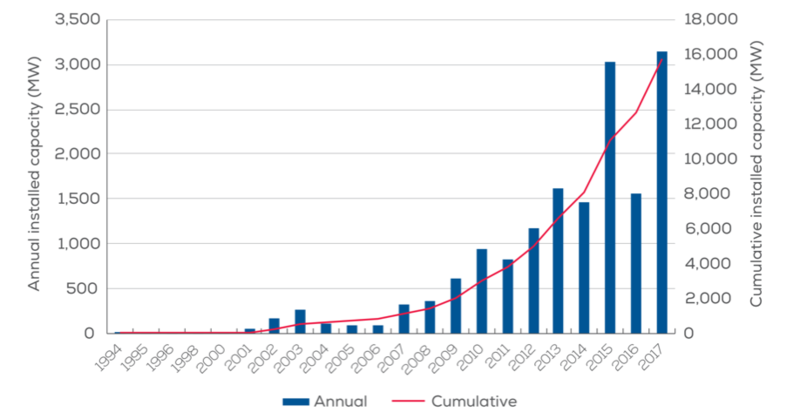 Offshore wind farming is expanding in response to renewable energy objectives and the attractiveness of the industry in terms of technological development and jobs. The location of offshore wind farms is mostly driven by cost: Locations with low depths, short cable routes and high winds are usually preferred. Technological advances and cost reductions enable wind farms to operate at profit, leading to more and larger wind farms being constructed. Turbines are also increasingly erected in deeper water further offshore, which may be helpful for addressing conflicts related to the visibility of turbines. The EU's Blue Growth strategy identifies coastal and maritime tourism as an area with special potential to foster a smart, sustainable and inclusive Europe. It is the biggest maritime sector in terms of gross value added and employment and is expected to grow by 2-3% by 2020. The challenge for MSP authorities is to balance benefits for the national economy with advantages and disadvantages for local coastal communities. Coastal tourism is a very important economic sector locally and in some EU countries also of vital importance for the national economy, so achieving the right balance can be a difficult task. In countries that use zoning, an obvious solution is to locate priority areas for offshore wind well away from the coast. Another way is to designate a tourism or recreational zone along the coast to prevent offshore wind farms from being built there. This can either have a fixed boundary, or be linked to a policy related to visual impacts. In its first plan in Mecklenburg-Vorpommern, Germany designated a reservation area for tourism that encompassed all coastal waters up to 12 km. Offshore wind farms were restricted to specially designated “suitable areas” outside this zone. In the revised 2016 MSP plan, the principle was softened by introducing a qualification related to the visibility of “vertical structures” which could disturb the visual landscape experience. In Poland, offshore wind farms are only permitted in the EEZ, a regulation that coincides with suitable areas; the legislation, however, came first. Not all areas around the coast have the same economic, social or environmental significance. Areas with certain types of tourism or valued for particular recreational purposes may be more susceptible to the impacts of offshore wind farming than others, for example. During the planning phase of MSP, social dimensions can be considered by using the concept of culturally significant areas (CSA). This method was developed to identify places of cultural importance on the coast and in the sea. It establishes what is valued by people, where these values are located, when in time they are relevant and to whom, and which places, features or areas are particularly significant compared to others. For economic concerns, it is possible to make an economic cost benefit analysis for the area to be able to weigh the expected economic costs against the benefits it may bring. Data on recreation and tourism activities in coastal waters are often lacking when the MSP process begins. Due to their limited size, recreational vessels are not obliged to carry AIS transponders which means the exact routes these vessels take are largely unknown. A solution is to create a bottom-up database of important recreation areas. 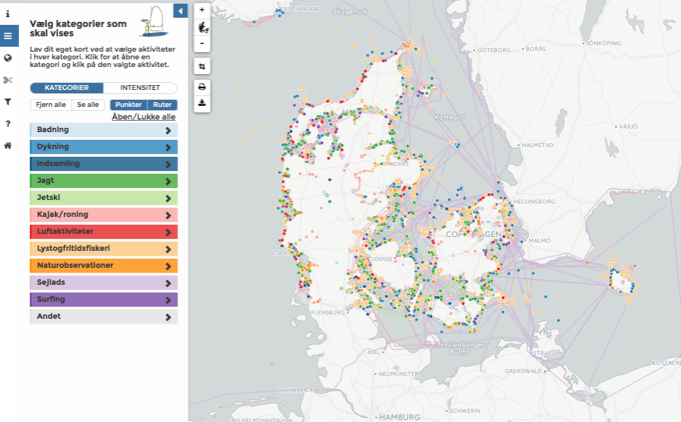 The Danish project Havfrilufsliv was an open source database where anyone could add recreational sites or routes, such as areas where they go to kayak, to surf or watch nature. The insights provided by the database were used in the follow-up project “Vandfuglefriluftsliv” (http://www.vandfuglefriluftsliv.dk/), designed to assist the Danish MSP process on the topic of tourism. In areas with high levels of tourist activity, MSP authorities could take measures to decrease the impact of offshore wind farms, such as changing their location or design. Solution 4: Develop a Tourist Impact Statement and possibly include it as standard part of the SEA or EIA. Tourist Impact Statements are statements by developers on the likely impacts of the development on the local tourist industry. They also set out the methods that can be used to minimise any costs on local tourism and maximise any benefits (e.g. access arrangements). In the Scottish regional planning processes Tourist Impact Statements are already a recognised (although informal) part of the planning process. Tourists Impact Statement could be integrated in environmental impact analysis wherever tourism plays a major role. The statements include information such as the number of tourists travelling, views from tourist accommodation, the scale of tourism impact and the outdoor activity in the area of development. It is prohibited to go diving, kite surfing, or to dispose any garbage. The Dutch decision creates the opportunity for the recreational sector to have new destinations, for example a trip to the offshore wind farm itself or to the United Kingdom (Scorby Sand). However, there might also be extra costs. These include costs for enforcement of the rules; potential costs when a collision happens between a vessel and a turbine (estimate: one collision per 80 years per farm) and costs to ensure accessibility by helicopter in emergency situations. During the discussion on the pass-through, ideas were proposed to remove the AIS duty and replace it with a simple notification, as well as to place buoys for recreational vessels to have a break. However, security concerns were seen as more important. The current policy will be reviewed in 2020 and possibly extended or improved. Instead of designing an offshore wind for optimum wind energy generation only (one use), it could be an option to think of multi-use combinations with tourism in the early phases of the process. In case a government is tendering an offshore wind farm, it could for example include requirements for a new offshore wind farm to establish facilities for recreational boating. In this way easy pass-through routes could be developed for recreating boating within the wind farm. Visiting an offshore wind farm can provide an added value to existing boat tours and make them more attractive. It also gives tour operators an opportunity to offer additional promotional products, such as the possibility for angling. Other tourism activities could be facilities for divers, with offshore wind farms functioning as an artificial reef, and offshore restaurants in the vicinity of a wind farm. Offshore wind visitor centres may serve as additional tourist attractions, serving an educational purpose related to knowledge and the image of the green energy sector as well as promoting the sector to young persons and thus potential future employees. Examples of offshore wind – tourism multi-use include wind farms in England; the Scroby Sands OW Farm in Great Yarmouth, for example, attracts over 35,000 visitors every year. In the case of the Gwynt y Mor OW Farm, a £690,000 fund was designated by the OW developer to support tourist activities during OW construction. 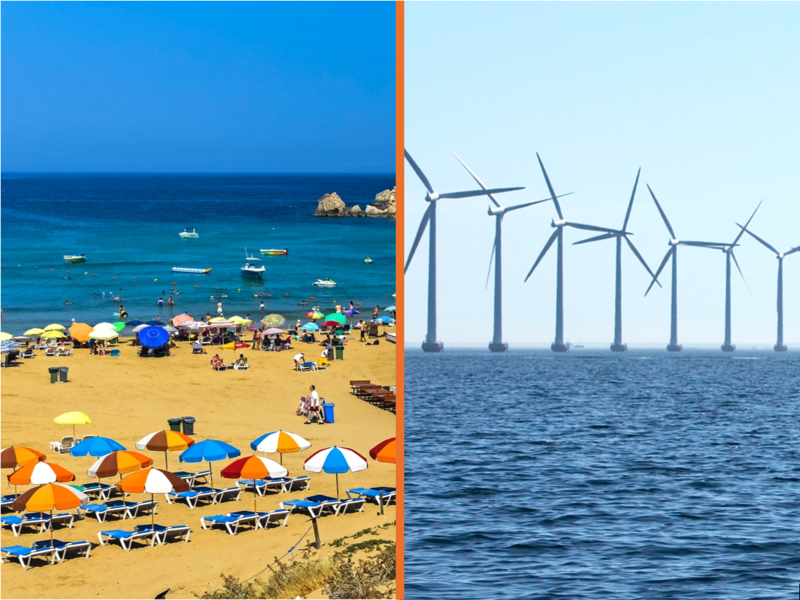 Regional and municipal authorities often resist offshore wind farms close to the coast because of the possible negative effects on tourism, recreation and the local economy. In the MSP process it is therefore important to involve them adequately and to clarify and acknowledge their concerns. A strategy to increase the acceptance of offshore wind by those stakeholders is to ensure that the offshore wind farm project actively contributes to the local/regional economy, or to use cooperative models such as the Danish example. Although its outcome remains uncertain, the Estonian case also provides a good example, with an agreement achieved on jobs for maintenance and training, a compensation scheme for natural sites/ NGOs, the use of renewable energy for the region, and wind farm design that reduces visibility of the turbines to a minimum. Offshore wind turbines are tall structures and can be seen from a long distance. It falls to the MSP authorities to seriously consider any concerns regarding their visibility, both in the MSP process and final plan. One way is to use interactive viewer tools similar to the Dutch example, or to include pictures from several viewpoints from the coast to the different offshore wind farms in the MSP area. The text of the plan should also mention visibility and outline possible mitigation measures. Communication on the impact of offshore wind farms should be transparent and clear and not contain any mixed messages or conflicting statements from different authorities. It is helpful to work on a coherent strategy beforehand. The major cause of conflict is the need for offshore wind farming to be as cost-effective as possible. Future trends, such as floating wind turbines, energy islands with Power-to-Gas possibilities, as well as sea basin grids could decrease costs and would provide opportunities for building offshore wind farms further offshore. An MSP authority can act as a passive organisation, facilitating different uses, but can also become a more pro-active organisation, stimulating innovation in the sector and providing room in the MSPs for innovation. The current MSP development processes in Belgium and the Netherlands have a stronger focus on incorporating innovation. In the Netherlands, funding for innovation comes from the ‘top sector’ policy, specifically the fields ‘water’ and ‘energy’. With these top sectors, in the Dutch MSP process, the North Sea Energy Lab has been developed. This initiative provides input for the Dutch MSP process and can speed up the development of new technologies by using a social network approach.